The British Foreign Office relaxed its restrictions on travel to Egypt last month. This is good news for all those whose livelihoods depend on the tourist industry, and a positive note on which to end this year which has seen so much political drama in Egypt. 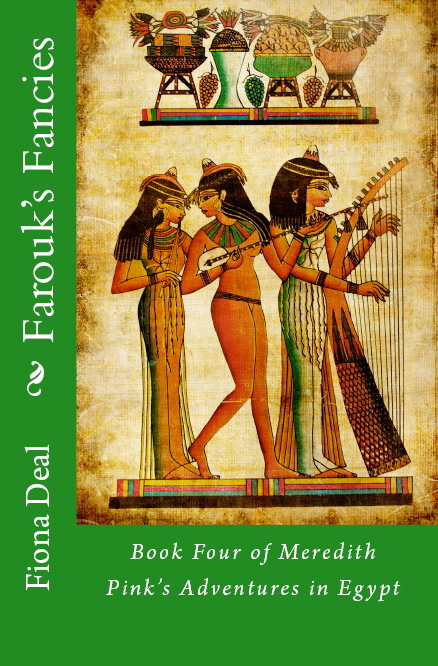 As Egypt ends the year on a more positive note, so do I with the publication of the fourth book in my series following Meredith Pink’s Adventures in Egypt. This story is set in the spring of 2013, before the events of the summer, which saw the ousting of President Mohammed Morsi from office. Merry’s latest adventure, Farouk’s Fancies, draws on the events which saw the monarchy topped in Egypt and King Farouk sent into exile. It was interesting to observe the political situation unfolding in Cairo this summer while writing about broadly similar themes which saw Farouk removed as king. The story also involves the Dead Sea Scrolls and the theories put forward by some historians claiming key figures in the Bible were in fact ancient Egyptian pharaohs. I look forward to a return to Egypt and to continuing the adventures of Merry and Adam. I’m starting to think about how they’ve experienced the latter half of 2013 in Egypt and where their adventures will take them next. Posted on December 19, 2013 by Fiona Deal. This entry was posted in ancient Egypt, Egypt, egyptian fiction, fiction, History, Travel, Uncategorized, writing. Bookmark the permalink.